Ranking 71st on the Forbes global fortune list, Leonardo Del Vecchio is the second wealthiest man in Italy. He is the president and founder of the world’s leading company in the development, production marketing and distribution of glasses. The company is none other than Luxottica. They make their own glasses and are world leaders in the eye glasses industry. 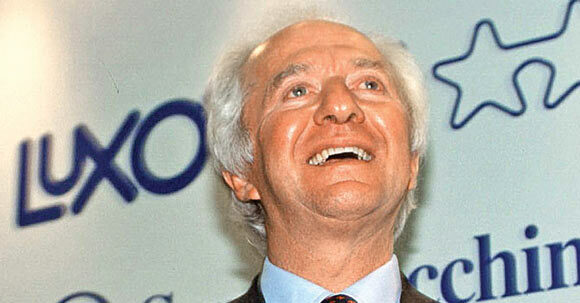 The self made successful business man, Leonardo Del Vecchio boasts a net worth of $11 billion. Leonardo was born to a poor Milanese family in 1935. Leading a fatherless childhood, he was forced to live in an orphanage at the age of 7 under the care of nuns and at the age of 14, circumstances required him to work in order to support his impoverished family. His first job was in Milan working as a novice with a tool manufacturer. He joined evening classes studying industrial engineering at the age of 19, continuing working during the day all along. With time Leonardo became fascinated and much passionate about glasses and frame and this drove him into moving to a small village in Venice known as Agordo, where one can find all the players of the eye glass industry offering a lot to learn about the trade from design to marketing. In 1967, Leonardo took the decision to enter the glasses assembly business. He now had 6 years of experience but it was not easy due to fierce competition. Expanding his work, Leonardo found his own company, Luxottica. Ten years later in 1976, Luxottica stopped making frames for other brands and launched its own eye wear brand. Using extensive research, the brand went on to become the market leader. There was no looking back; Leonardo’s effective strategies helped him in developing a successful sales network. Leonardo’s futuristic approach, timely decisions and strategies helped Luxottica to have full control and take over every stage of the eye glass manufacturing process. The Luxottica group now also began acquisitions in areas of distribution and retail. The group eventually took over some of the most famous Italian brands such as Lens Crafters, Persol and Vogue moving on to acquiring Ray Ban, the most famous American brand. Over the years, Luxottica has been seen to acquire all major eye glass brands including Oakley which was bought for $2.1 billion, giving Luxottica a major break in the sports segment. In addition to this, Luxottica now manufactures for the world famous brands such as Versace, Ralph Lauren, DKNY, Ferragamo, Prada, Chanel and Armani.